As many pet lovers know, fireworks and thunder storms can cause a great deal of stress for some animals. Fear of loud sounds - fireworks, thunder, gunshot - are called noise phobias. For a pet affected by loud noises, this is a terrifying and uncomfortable time; both for the pet and the people. Your pet cannot control their reaction to loud noises. Many therapies exist to help with this condition. Learn to recognize the signs of noise phobias and some tips to reduce fears. As always, talk to your vet if this is a problem for your pet. Behavior modification alone works well for some pets, others may need medications in addition to behavior modification to be safe and not injure themselves trying to "escape" the noise. Please note: The signs mentioned above are general signs, and could be indicative of many different diseases or conditions. Please consult with your veterinarian if these signs persist after fireworks or thunder has subsided, or if you suspect that your pet may have been poisoned or is otherwise ill. Trying to escape from the loud noises can mean broken windows, torn fences, chewed doors or dog crates, and result in lacerations, foot pad injuries, teeth and mouth injuries or worse as they try to run from the disturbingly loud noises. It doesn't matter if the fears are "rational" or not. It should be noted that scolding a frightened animal is not effective will only intensify the fears. Keep pets home It may be tempting to bring along your dog(s) so everyone can enjoy the fun, but the loud noises aren't usually fun for pets. Plus, there are many other hazards - fire, food (dietary indiscretion), getting lost in the confusion, etc. that make staying home in a comfortable safe environment a good choice. Keep pets indoors if possible It is advisable to close the curtains and turn on the TV or radio to provide some distraction. Calming or classical music are better than some TV or radio noise choices. Therapeutic music such as Through A Dog's Ear often work better at keeping your dog calm and providing an audio distraction. Provide a safe "escape" place Many times pets will seek out a small den-like place (such as a crate), if they are fearful or stressed. If you do not already have a crate, bed or similar place that your pet can call his "own," it is recommended to create that safe place and familiarize your pet with it before needed, as a means of reducing stress during fireworks and thunderstorms. Use a leash or carrier If you must be outside with your pet, keep the pet on a leash or in carrier at all times. Practice fire safety Keep pet away from matches, lighter fuel, open fires, and fireworks - especially ones that are lighted on the ground. Pets may try to sniff (or eat) fireworks, and pet hair can easily catch fire if too close to the fireworks. Take pet for a walk first If possible, make sure that you pet has time to "use the restroom" before the fireworks start. Some pets are too frightened to void once the fireworks begin, and this may lead to an "accident" later on. Make sure pet ID is current Make sure that your pet has proper identification tags, with current information, in case s/he gets away. This will help the local authorities (who are quite busy this time of year handling frightened runaways). 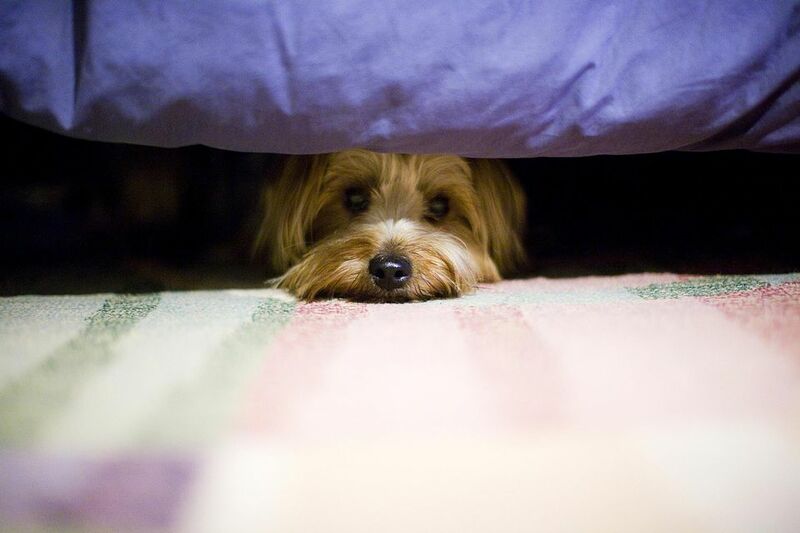 What else can I do if my pet is frightened of fireworks and thunder? Animals that are frightened and stressed may hurt themselves and possibly escape if left alone, and the results can be fatal. Frightened animals running loose are in great danger of being hit by a car or other accident. In addition to the tips on page one, here some ways to help reduce your pet's fear of loud noises. Behavior modification takes lots of time and repetition. Short, positive sessions are best. Work on this when your pet is calm and be patient. To help your pet become accustomed to thunder and other loud noises, you can try some desensitizing behavior modification. This technique involves playing a recording of thunder at very low levels. It may be difficult, but refrain from soothing or petting your dog during this time. This often only encourages the fearful behavior, confirming that there is something to be afraid of. Additionally, if you are nervous, your pet may pick up on that. Instead, offer distractions - give a command, play a game, offer task-oriented distractions. Rewards or praise can be given for these activities and immediately after the task is completed so the dog makes the connection. Gradually increase the volume slowly over time, as your pet is able to handle the sounds without getting stressed. To reiterate from page one: scolding a frightened animal is not effective will only intensify the fears. If your pet is not progressing, have patience, lower the volume and keep the sessions short and positive. Consult with your veterinarian and/or a veterinary behaviorist for additional guidance. Many stores carry "relaxation" types of music, and I have seen several rain/thunderstorm CDs available. It is important to remember that this technique requires time and patience for it to be effective. Start slow, and do short sessions only at first. I play the Through A Dog's Ear music for my thunder-phobic dog, and it really does seem to help add some calmness, especially if I start the playing the music early on. I also like listening to this better than a loud TV or other music. Some people report that using products such as DAP (Adaptil) collar (Dog Appeasing Pheromone, similar to Feliway) or Bach Rescue Remedy for thunderstorm and firework phobias help keep pets calm. Some animals need more help for thunderstorms and loud noise phobias. If your pet is in danger of injuring himself or running away (and potentially becoming lost or injured), please speak to your vet about prescribing medication suitable for your dog or cat. The newer anxiolytic drugs, such as Alprazolam (Xanax), are much more effective at stopping the phobic behavior and are preferred over drugs such as Acepromazine. A patient-doctor relationship is needed before dispensing medications, so if your pet hasn't seen the vet yet, an appointment will need to be made to examine the animal to ensure that there aren't any underlying heart or other problems, and base medications on current weight. Please do not use human medications or medications prescribed for other pets, as drugs are specific for each patient's needs, overall health, and weight.